Computer starting to run slowly? As computers age it seems with each passing year they become slower and slower but why? As programs are installed, hard drive space becomes filled, updates are applied, and newer technology requirements become the standard older computer's just get slow. So what is the trick to extending the life and speeding up your old system? You might be surprised to know that the slowest part of most computers, especially laptops, is the hard drive. Many manufacturers will tout the biggest and baddest processor, more and more memeory, and larger hard drive space but what are you really getting? The hard drives in most laptops are the slowest produced, starting with 4200 RPM drives and maybe getting 5400RPM with a premium model. So with that being said what can we do about it? The easiest and highest impact improvement you can make is to switcxh out that stock hard drive with what is called an SSD (solid state drive). these drives are made with simialr technology as a flash drive (or thumb drive, usb stick, whatever you want to call it). the benefits are a much much faster read and write time as well as lower power consumption and shock resistance. 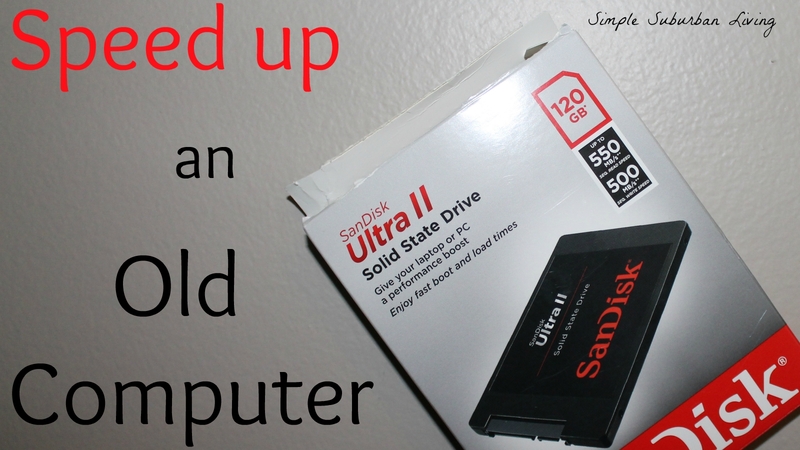 Replacing your current hard drive with a solid state drive and you will be surprised at home much faster that old computer can be. 1. Remove the old hard drive from the computer. Whether laptop, desktop, or all-in-one, this process may vary. In the video below I show how to do this with a laptop. 2. Once you have the old hard drive out it might be a good idea to purchase a hard drive enclosure. This will allow you to hook up the old hard drive with all of your data on it to the computer to use as extra storage. 3. Install the SSD. The drive is very easy to install and should look just like the one you took out (except desktops and older all-in-ones which have a larger drive). If you have a desktop you might need an adapter bracket to mount it in the same spot or you can screw it to the framing anywhere you see fit. These drivers are shock proof and do not need to be oriented in any certain way. Just throw it in there if you want( although not really recommended). 4. Using an operating system disc or the recovery media that came with or was pcreated from your computer when purchased you will now need to reload the new hard drive. This process is fairly automated on new computers but you may have to do some installing of any other softwre you use such as office, security software, or others. Once this is done you now have a computer that will last you many more years and might even run faster than the day you bought it!